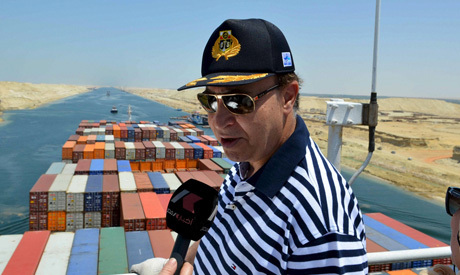 Egypt’s President Abdel-Fattah El-Sisi issued a decree Sunday appointing chairman of the Suez Canal Authority Mohab Mamish as head of the canal’s economic authority as well, replacing Ahmed Darwish, state news agency MENA reported. The presidential decree stated that Mamish will be responsible for the economic zone for a year while also performing his duties as the chairman of the Suez Canal Authority. A flagship project for El-Sisi, the special economic zone extends over 461 square kilometres across the three Suez Canal governorates of Suez, Port Said and Ismailiya, and will include six maritime ports, to be completed by 2045. Mamish, a former member of Egypt's Supreme Council of the Armed Forces, was appointed to the position in 2012 during the term of ousted Muslim Brotherhood president Mohamed Morsi. Before heading the authority, Mamish commanded Egypt's navy. Mamish’s term as chairman of the Suez Canal Authority has been routinely renewed, despite reaching retirement age, by both the country’s former interim president, Adly Mansour, and by President El-Sisi. Darwish served as minister of administrative development in the last seven years of former president Hosni Mubarak's rule.